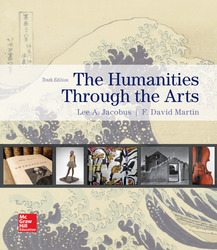 The Humanities through the Arts, tenth edition, explores the humanities with an emphasis on the arts. Examining the relationship of the humanities to values, objects, and events important to people is central to this book. Our genre-based approach offers students the opportunity to understand the relation of the arts to human values by examining in-depth each of the major artistic media. Subject matter, form, and content in each of the arts supply the framework for careful analysis. Chapter 2. What Is a Work of Art? Chapter 14. Is it Art or Something Like It?